Samsung has doubled down in the mid-range segment by launching the new Galaxy A series and Galaxy M series devices. On Wednesday, the Korean company unveiled three new phones in the Galaxy A series, namely Galaxy A80, Galaxy A70, and Galaxy A40. The A80 and A70 are the best of the lot while the A40 is the cheapest. Here we take a look at the similarities and differences between the Galaxy A80 and Galaxy A70 to help you decide which one is a better buy. Both devices have a similar design with front and rear glass panels supported by a metal frame in the middle. The A80 measures 165.2 x 76.5 x 9.3 mm while the A70 measures 164.3 x 76.7 x 7.9 mm. It means both phones have similar dimensions except that the A80 is noticeably thicker. The A80 will be available in Angel Gold, Ghost White, and Phantom Black colors while the A70 comes in Black, Blue, White, and Coral colors. Both of them have an in-display fingerprint reader for authentication and security. The A70 gets an optical fingerprint sensor, which is not as secure as the ultrasonic fingerprint sensor on the Galaxy S10 series. It’s unclear whether the A80 has the optical or ultrasonic sensor. Talking about the differences, the A70 retains the 3.5mm headphone jack, which you won’t find on the A80. The A70 has a traditional bezel-less display with a water-drop notch. The A80 has completely ditched the notch because Samsung has used an innovating sliding and rotating camera mechanism. When you need to take a selfie, the triple camera setup slides up and rotates to selfie mode. It means the rear camera system also serves as the front-facing camera. The A70 has a traditional vertically aligned triple camera system. It accommodates the front-facing camera in the waterdrop notch. 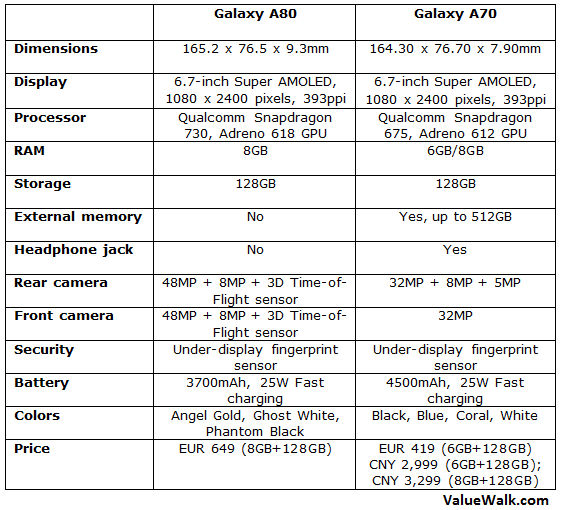 Both the phones have the same 6.7-inch Super AMOLED display with Full HD+ resolution of 1080 x 2400 pixels. They both have an 86% screen-to-body ratio, 20:9 aspect ratio, and 393ppi of pixel density. However, the A80 has an uninterrupted display without any notch while the A70 features a U-shaped notch. That’s why Samsung calls it the Infinity-U display while the A80 screen is simply called the New Infinity display. Both handsets offer dual-SIM slots. They both run the latest Android 9 Pie with Samsung’s custom One UI skin on top. While the A80 lacks external storage, the A70 gets a dedicated memory card slot with support for up to 512GB of external memory. The A80 is the more powerful of the two. It runs Qualcomm’s latest mid-range Snapdragon 730 processor with Adreno 618 graphics chipset. It packs 8GB RAM and 128GB of internal storage. There is no other RAM or storage variant. The Galaxy A70 comes in two different RAM options of 6GB and 8GB. It offers 128GB of internal storage. The A70 runs a slightly less powerful Qualcomm Snapdragon 675 chipset with Adreno 612 graphics processor. The A80 packs a decent 3,700mAh battery while the A70 gets a much bigger 4,500mAh battery that should easily last more than a full day of normal usage. Though the A80 has a smaller battery, Samsung has added some intelligent software features to reduce energy consumption. Both phones feature a USB-C port that facilitates 25W Super Fast charging technology. Neither of them supports wireless charging. This is where you’ll notice the biggest difference between the two phones. The A80 features an innovative rotating slider triple camera setup that serves as both the rear camera and selfie camera. It slides up and flips around to the selfie mode when you tap on the selfie mode in the Camera app. It consists of a 48-megapixel primary lens with an f/2.0 aperture, an 8MP ultra wide-angle lens with an f/2.2 aperture, and a 3D Time-of-Flight sensor. The same setup is also used to take selfies. The Galaxy A70 also features a triple camera setup on the back. It includes a 32MP main lens with an f/1.7 aperture, an 8MP ultra wide-angle sensor with an f/2.2 aperture, and a third 5-megapixel depth sensor with f/2.2 aperture. On the front, it gets a single 32MP lens with an f/2.0 aperture. The Galaxy A70 is scheduled to hit the store shelves on April 26th while the A80 will become available on May 29th in Europe, Australia, China, Russia, and many other markets. Samsung has priced the Galaxy A80 at EUR 649 in European markets. The Galaxy A70 is a little cheaper at EUR 419 for the 6GB+128GB model in European markets. In China, it has been priced at 2,999 Yuan for the 6GB+128GB version and 3,299 Yuan for the 8GB+128GB variant. 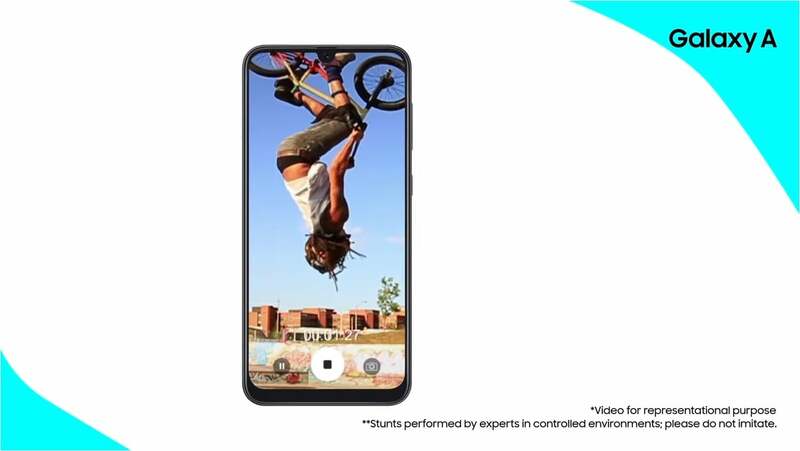 The Galaxy A80 is the more exciting of the two with a sliding and rotating camera setup and a fully bezel-less and notch-less display. But the A70 is more affordable, has a bigger battery, retains the 3.5mm audio jack, and supports a microSD card slot.